In this exquisite Maru Obi, what makes the coloration so different is the tremendous amount of pure gold threads woven into the design. 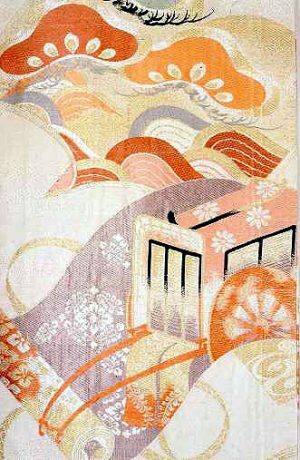 The gold is not only part of the intricacy of the pattern; it has also been woven into the background, creating an overall sheen to this Obi that is unparalleled. Add to this the depth and brilliance of the remaining colors, with the inclusion of the rare lapis that also appears to be almost purple, and this is a stunning example of the very best Obi to have been produced in old Japan. The design is absolutely magnificent, with little space that is not occupied by a traditional symbol of Japan: the chrysanthemums, the royal carriage, the open fan with the glorious flying crane superimposed over it, the half wheel, and numerous geometric motifs among the background. 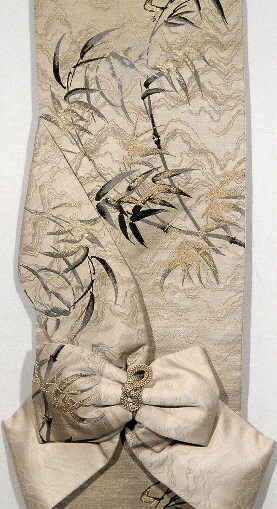 Each of these elements represents something significant in the life of the woman who wore this Obi; for example, the Chrysanthemums (“Kiku”) are the flower of the Royal Household, the Open Fan (“Sensu”) represents an open future, while the Crane (“Tsuru) stands for longevity and good fortune. 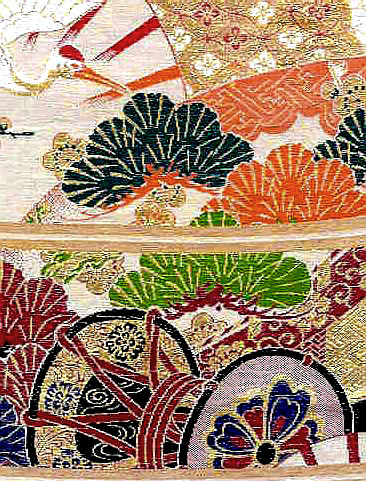 The overall effect of this Obi is one of great wealth and beauty, while the gold stripes at the bottom of the pattern denote that a woman of high rank and status in Japanese society wore this Obi. 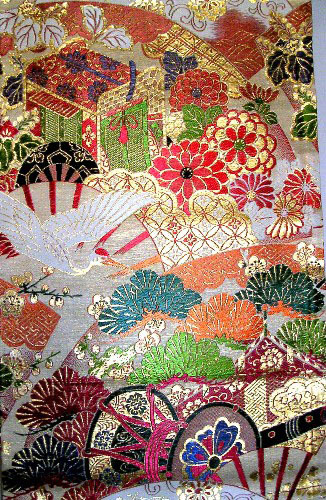 This is an extraordinary example of the most elaborate of the “Maru” Obi to be hand woven for Japanese women before the turn of the century. 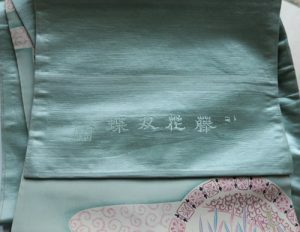 A Maru Obi is the most formal and expensive of the hand woven Obi. It has but one seam, meaning that the Obi was woven in one continuous panel before being folded over in such a way that the pattern was not lost in the fold.